This Winter storm had a major impact on trees in the metro as branches are scattered throughout the area, therefore the city is implementing a new service for residents by picking up the branches. KANSAS CITY, Mo. — This Winter storm had a major impact on trees in the metro as branches are scattered throughout the area, therefore the city is implementing a new service for residents by picking up the branches. 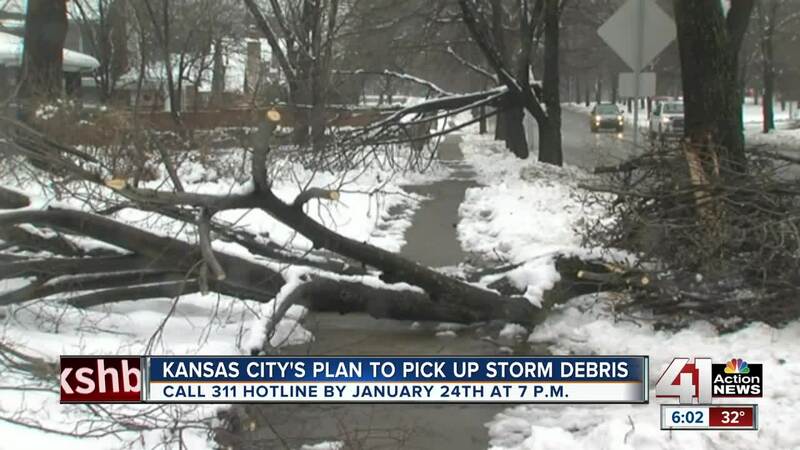 But before that happens, residents need to call the 311 hotline by Jan. 24 by 7 p.m.
After that, you have to have your branches at the curb by 6am on January 28th in order for them to be picked up. The city said the 311 hotline had been ringing off the hook since the storm, so they wanted to do something to help residents. “Our phone call takers have been deluged with phone calls we have gotten hundreds of calls in the past couple of days for downed branches and so that's why we are establishing this extra service for our residents,” said Chris Hernandez, KMCO spokesman. Also something to keep in mind, the branches have to be six feet or shorter in order for them to be picked up. The city is also waiting until after this weekend’s storm to do this because they said even more branches could come down. Also important to note, bags of leaves will not be collected during this time. Workers will also be on 12-hour shifts starting today. To connect to 311, click here . We compiled a list of other metro city's plans for storm debris at this link .